Lines. Clashes of lines. Playing with lines. On the first day of 2018, this was what I wore. Neutrals. My comfort zone. I don't know why but I kind of feel even more confident in this kind of colours. Sometimes when you find something that suits you best you just feel good in it. For me, neutral colours like this make me feel super comfortable and extra confident. And I just need that kind of boost sometimes. I spent the first day of 2018 with my family and the husband captured this shots in between our family outings. I feel good and confident coming into 2018 and I'm extremely excited for whatever that is going to happen personally with my family and friends, business and career wise this year. I must admit I sometimes feel a little anxious too. It's already reaching almost the end of the first month of 2018 now and I feel so pumped up for what's to come this year. Everything will go well, God-willing. May He ease everything. Anyways, I paired aere's VALYN Peplum Top from the CHANGE collection with corduroy pants and a textured scarf. All with lined textures. 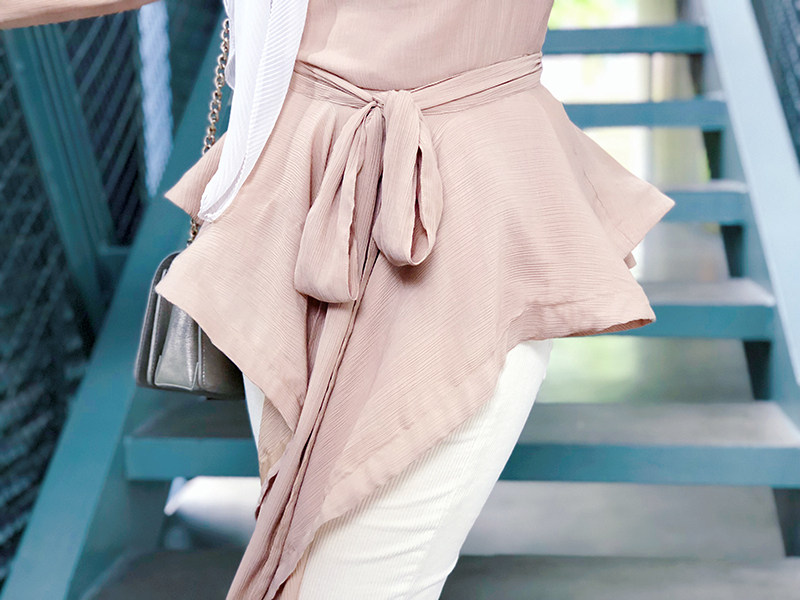 Shared a lot more about aere's VALYN Top in my post POP OF PEPLUM IN DUBAI where I wore the same top but in a different colour. Now that I've shared about my comfort colours, what's yours? She is beautiful, where is she?